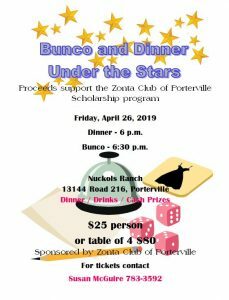 Applications for the 2019 Zonta scholarship awards are now available from the Zonta Club of Porterville. Young women graduating from Porterville Unified and Burton School Districts are encouraged to apply. The 2019 Young Women in Public Affairs Award recognizes commitment to the volunteer sector, evidence of volunteer leadership achievements and a dedication to the empowerment of women. Applicants are asked to reflect on their voluntary commitment to their school and community and the problems limiting the empowerment of women in their own country and worldwide. The successful applicant will also be eligible for additional awards from Zonta’s District and International avenues. The 2019 Community Service Award recognizes one who contributes to her community through volunteer activities. The Community Service Award was originally established to honor past Zonta member Mona Gauger. Each award is for $1,000 and is given in its entirety at the respective school’s awards ceremony. Applications are available from each high school’s scholarship coordinator or from Donna Raymond by calling 560-8672 or donna@ocsnet.net. Applications must be received by March 1, 2019. Zonta also funds an award to Porterville College recognizing a Re-Entry student. Additionally, college age women are eligible for the Jane M Klausman Women in Business Scholarship and the Amelia Earhart Fellowship. Information and applications are available at the Zonta International website. Advocating of Zonta International’s mission of advancing the status of women worldwide. Click here for Young Women in Public Affairs (YWPA) scholarship application.